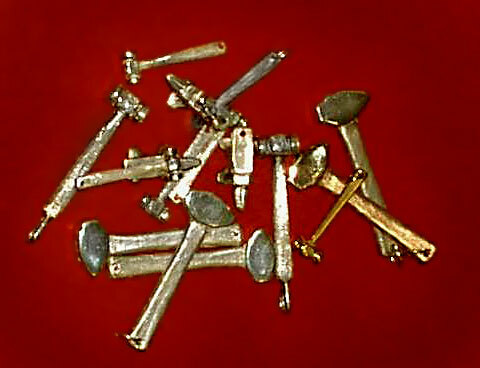 I made some tiny little hammers and anvils that are a must have for the metalsmith. They make great earrings and pendants. I usually sell these at blacksmithing conferences and gatherings. Pictured here are a few of the hammers and anvils I have available which run between $25 and $45 in sterling. All jewelry is available in sterling or gold. Custom orders always welcome. To inquire or place an order, please contact me. Sterling silver hammers. Two styles...rounding and Hofi. Two sizes of the rounding. Lil anvils.$35 ea in sterling. 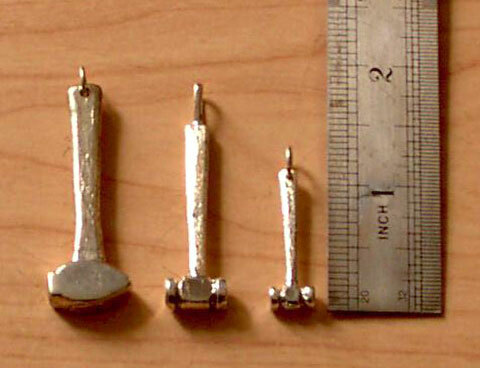 The small rounding hammers are $25 ea., the large rounding is $35 ea., and the Hofi is $45 ea...... all in sterling.